The BioWin 6 course will explore this soon-to-be-released major upgrade. It will merge BioWin and PetWin, and will included huge changes and new features (details of these are below). New Drawing Toolbar with UNDO!!.. Industrial soluble hydrocarbons – phenolics, benzene, toluene, etc. with different kinetics and stoichiometry from organics in municipal wastewater. Sulfur modelling that tracks processes such as sulfate reduction to sulfide, potential H2S stripping, growth of various sulfate-reducing biomass populations, sulfide oxidation, and so on. A completely reworked chemical P model. EnviroSim has been heavily involved in research on chemical P modelling and has synthesized this expertise into a practical model which we have tested on many sets of real data. Another detail worth noting is that now it is possible to have all three metals – ferric, ferrous and alum – in play at the same time – no more need to select one metal type or the other as was the case in the past. The new chemical P model allows for the option of modelling colloidal adsorption (and site competition with phosphorus) which allows for simulation of chemically enhanced primary treatment. It will be possible to include possible ferric reduction to ferrous in digesters….. and possible vivianite formation [or FeS]. BioWin 6 subdivides the unbiodegradable particulate material in the influent (Fup) so that it splits off a separate cellulose portion. The cellulose has its own Fcv (theoretical value for cellulose is 1.185), which again provides more fine-tuning of the model in terms of sludge production and digester performance. Furthermore, there has been some interest in cellulose recovery as plants transition to “resource recovery facilities”. BioWin has a new input element for solid organics for adding additional carbon sources into digesters; e.g. FOG. There also is N & P (optionally) associated with this, so that you can do proper assessment of the “cons” that might be associated with the “pros” of brining in external waste for extra biogas generation. Another important aspect is that the particulate COD for this stream has its own Fcv (COD:VSS ratio). 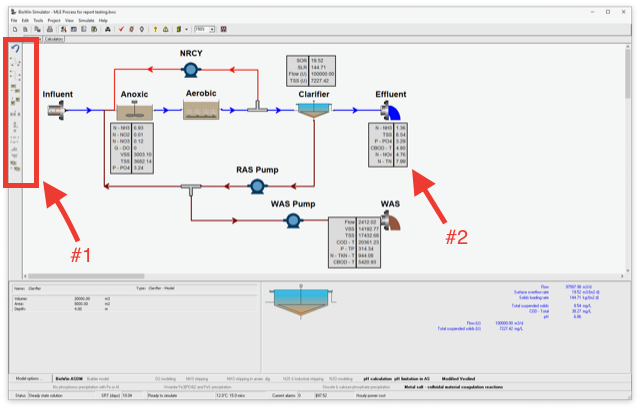 In the past, when BioWin users wanted to model external waste addition to digesters, it was often reported to us that the COD:VSS ratio for that stream was quite different from a typical municipal wastewater, and this caused issues in BioWin given that the Fcvs derived for the main influent stream didn’t work with the external waste stream. 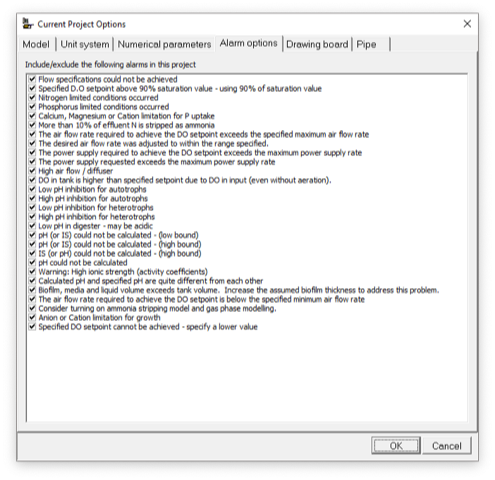 BioWin 6 includes the ability to generate extensive reports in Excel. The Excel report generated with one mouse click gives a very detailed overall mass balance summary for the system being simulated. These Excel reports can be user-tailored. The Excel file “BioWin Report” is an example. The template is used by BioWin to generate the actual Excel report “MLE Process for report testing”. Essentially, users can set up tables for what they want to include in their reports, what is included in the tables, etc. using a “template language”. [It’s not overly difficult to learn. And if users don’t want to get into that, they can simply edit our templates or involve us.] The formatting also is entirely up to users. The reports can include “post-BioWin” calcs; e.g. in some of the tables of the example report there are columns with “MLVSS/MLSS” which is calculated on the fly as the report is generated, not by BioWin itself! Other features are the option to have the report grab up everything out of the album (take a look in the later tabs of the example – those charts in the report are LIVE Excel charts, with all the underlying data available, not just static pictures) and the option to have BioWin append *other* spreadsheets to its Excel report (e.g. say a BioWin user has a design or costing spreadsheet that they would like to hook into the BioWin Excel report – BioWin can append it to its report). Item #1 on the screen grab below is the new Drawing Toolbar. See that curvy arrow at the top?? It’s an UNDO!! So if you mistakenly drag a flowsheet element, or delete one, etc. then you can just click UNDO. The drawing toolbar has other nice features, like buttons that will automatically align the vertical or horizontal centres of a selected group of elements – no more meticulously dragging elements around on the flowsheet to get perfect alignment. Item #2 on the screen grab below is something we’re simply calling “tags”. Essentially, every element has the option of showing a box (i.e. “tag”) with customizable content. Elements can show state variables, combined variables, and element specific variables – essentially anything that can be tabulated or plotted in the album for that element. 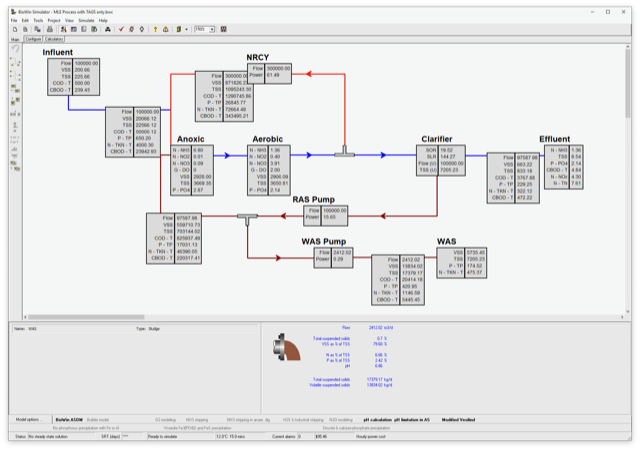 Pipes show mass rates of either state variables or combined variables. The colour of the tags can be customized; the location can be customized from one element to the next too. The tag can even replace the regular icon picture – see the second screen grab below! The tags are “live”; that is, they update when you run a steady state, etc., so they really help you focus on what’s important in one view – no more mousing over this element, looking at the lower right screen, then mousing over that element, looking at the lower right screen again, etc. The third screen grab below shows another nice feature – on a given project, certain (or all!) alarms can be optional. This 2-day course is an efficient way to get new users up to speed.